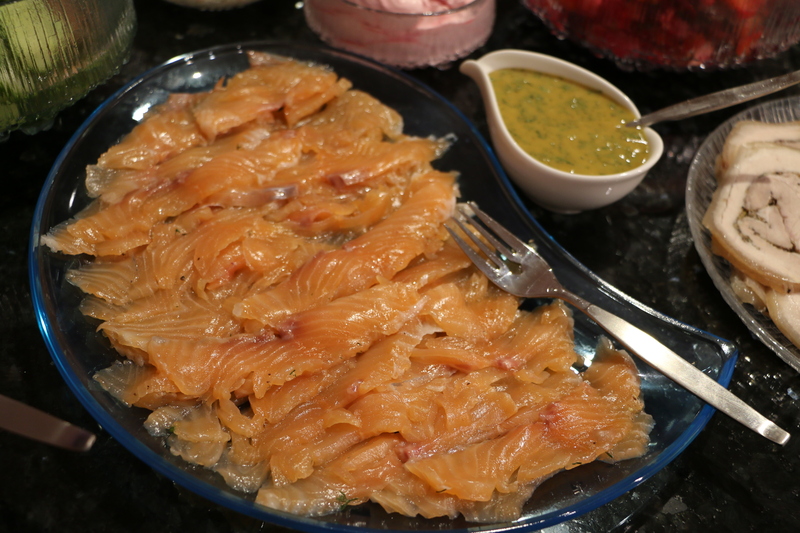 Dill sauce – a dressing prepared with lots of mustard and dill is a common accompaniment to the gravad lax – cured salmon – and other cured and smoked fish that are an essential part of the first course of the Finnish Christmas meal. It is easy to prepare provided one has suitable mustard. Those produced in Finland and Sweden are ideal, as they are flavourful, but not too strong and a little sweet. I use olive oil in the dressing, but one can use an alternative, such as rapeseed oil, if preferred. The dressing is best prepared a few hours before needed so that the flavour of the dill has time to permeate. If a blender of some sort is available, add all of the ingredients except the dill to a suitable vessel and blend until smooth and fully emulsified. Finely chop the dill and stir into the dressing. Refrigerate until needed. If preparing by hand, add the mustard, vinegar, salt, sugar, and white pepper, to a bowl and mix well. Whisk in the oil, a little at a time, making sure that it is fully emulsified at each stage. Finely chop the dill and stir into the dressing. Refrigerate until needed.